Rewilding Europe wants Europe’s native herbivores to return in significant, naturally balanced numbers to the lands where they once belonged. With domesticated livestock numbers on the decline in many European countries due to land abandonment, such herbivores can play a vital grazing role, opening up landscapes and enhancing biodiversity. To this effect, Rewilding Europe now supports natural grazing in 16 different pilot areas across nine countries. In Faia Brava, one of our largest natural grazing pilots located in northern Portugal’s Middle Côa Valley, wild Garrano horses are the herbivores now reshaping the landscape in a way that benefits a wide range of local flora and fauna. Wild horses are reshaping the landscape in a way that benefits a wide range of local flora and fauna. 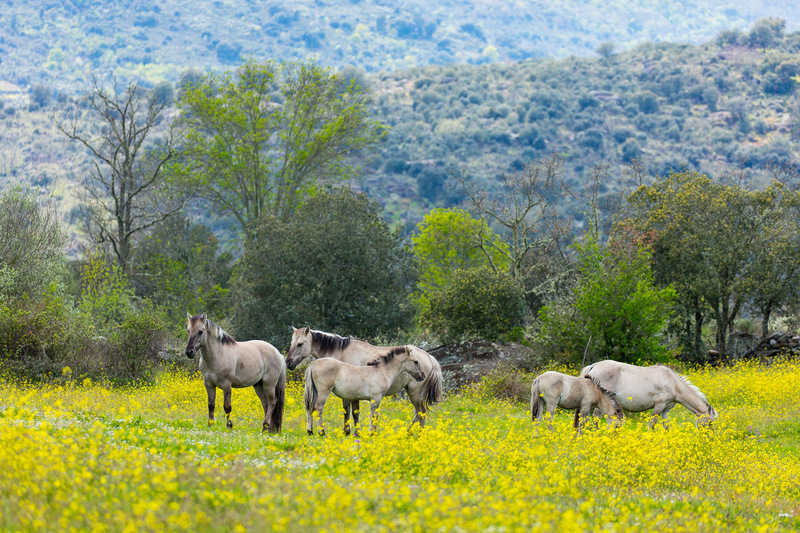 Thanks to the efforts of Associação Transumância e Natureza (ATN), our partner in the Western Iberia rewilding area, another site in the Middle Côa Valley will soon benefit from wild equine grazing too. 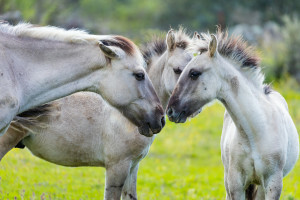 The Portuguese NGO has this year started the so-called Zebro Project, carefully selecting and cross-breeding Sorraia horses to maximise their wild characteristics. These animals will eventually be released as a herd at a site close to (but separate from) Faia Brava. “Our eventual aim is to recreate wild, free-roaming horses that will replace those that have been lost from the Iberian ecosystem,” explains Pedro Prata, the Western Iberia rewilding area team leader and ATN’s executive coordinator. 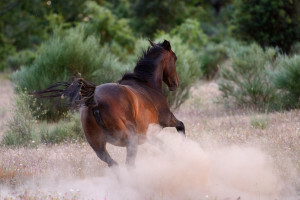 The rewilding of horses began back in 2005, when ATN introduced five Garrano horses into Faia Brava. Further introductions since then have seen the number of free-roaming horses in the reserve rise to an estimated 60 to 70 animals. These are now part of Rewilding Europe’s European Wildlife Bank. Like the Garrano, the Sorraia is an ancient horse breed that was once found wild across the Iberian Peninsula, but whose populations decreased dramatically under pressure from hunting and the rise of domestic livestock and mechanised agriculture. The Sorraia has a particularly interesting history, having once been called the “zebro” or “zebra” in Portuguese, due to its striped markings. The Sorraia horse was once known as a “zebro” or “zebra” in Portuguese, due to its striped markings. Hardy native animals that lived off uncultivated lands and salt marshes in Iberian river valleys, zebros were occasionally captured by farmers for agricultural work. A small population of Sorraia horses, thought to be direct descendants of the zebro, was discovered in the 1920s. It is from this stock that the lineage has been preserved, although the breed remains rare. In its attempt to recreate the zebro, or a genetic approximation of this ancient wild equine, the challenge is to identify the right horses for breeding. Since the beginning of 2017, ATN has acquired several stallions and mares displaying the Sorraia phenotype. The plan is to acquire further animals this year, using part of the ATN membership fee for acquisition, transport and habitat management, and to launch a new line of merchandising to celebrate the project. While the European wild horse is officially extinct, its genome is not lost and still exists across several types of old horse – from Exmoor ponies in the United Kingdom to the Hucul ponies of Eastern Europe’s Carpathian Mountains. These primitive animals still boast many of the characteristics and genetics of their ancestors, making them particularly suitable for rewilding and the grazing of wild habitats. Rewilding Europe’s brochure on rewilding horses can be viewed here.